File - The amusement park and "Mickey's Fun Wheel" at Paradise Pier in Disney's California Adventure is seen in this 2010 Anaheim, California, spring afternoon photo. Walt Disney says it has raised ticket prices to attend Disneyland, Walt Disney World and the rest of its U.S. theme parks, effective Sunday. 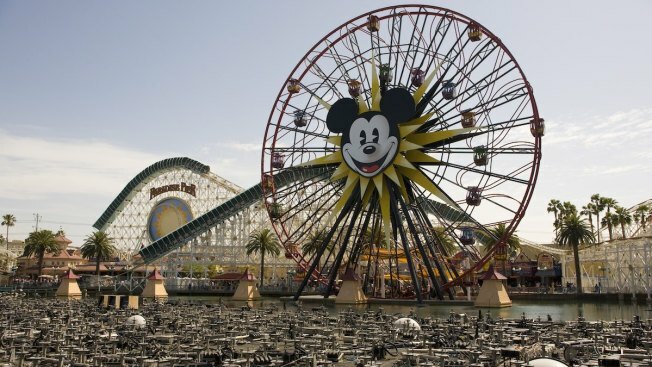 A one-day ticket for either Disneyland or California Adventure in Anaheim, California, is now $99 for anyone 10 or older. That's up from $96. Single-day tickets for the Magic Kingdom at Walt Disney World in Lake Buena Vista, Florida, are now $105, up from $99. A one-day ticket to Disney's other central Florida theme parks -- Epcot, Disney's Hollywood Studios and Disney's Animal Kingdom -- are $97, up from $94. For children under age 10, a single-day ticket is $93 for Disneyland, $99 for the Magic Kingdom and $91 for the other theme parks.